I create each piece in a private studio located in the northern Colorado mountains. 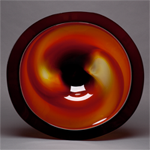 I blow contemporary glass using traditional tools combined with both traditional and non-traditional techniques in a small, modern studio. Much of my artwork is performed solo in the tradition of the forefathers of the early American small studio movement, which began in the early 70’s. This was the way I was taught and remains the root of my style of work. 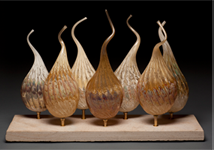 I am currently exploring the possibilities that arise when another set of hands, or an assistant, are available to aid in glass forming process. My current work is a combination of solo and assisted work. 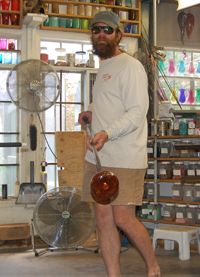 The glass blowing process begins by gathering molten glass from a furnace onto a blow pipe. The temperature of the glass exceeds 2000 degrees Fahrenheit at this point. Color is then applied in a myriad of fashions. 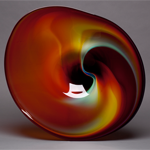 When the amount of glass is set and the colors have been manipulated to the artist’s satisfaction a bubble is then blown into the glass. The bubble is then coaxed into the desired form using a variety of tools (jacks, paddles, wet newspaper). 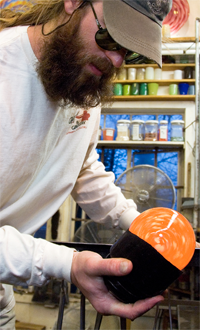 Much of my work involves two or more bubbles that are fused together in a process known as incalmo. The finished piece is then placed into an annealing oven where it cools slowly at a controlled rate.